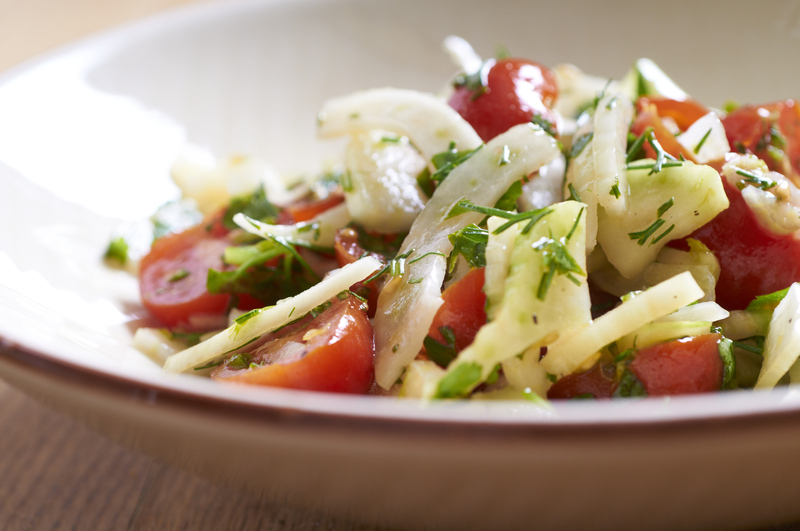 Toss fennel, tomatoes and cilantro together in a bowl with the lime juice and olive oil to coat. Season with salt and pepper to taste, serve cold. ** To trim fennel, cut the stalks away from the bulb, reserve enough fronds to add to the salad. Cut the bulb in half from the top to the bottom, then in half again, same way. Next take each quarter fennel bulb on its side and slice the point off on a diagonal, this will remove the tough base of the bulb. Then slice on the bias thinly. Veggie side recipes are abundant, but often never tried out- we all have our favorite ways to eat veggies and usually seeing a recipe like this one seems too much work. But we made this semi marinated, and served it hot because that’s what we wanted with our dinner. It’s important to know that you can alter recipes to suit YOU. 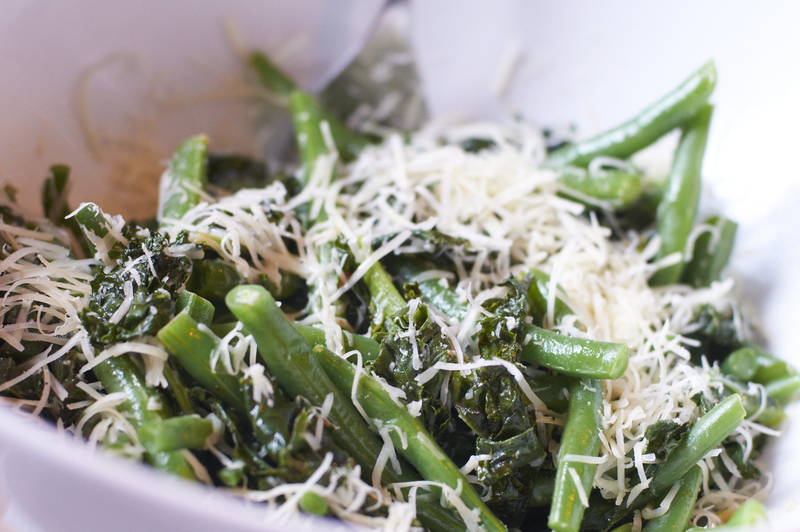 So here we have not really marinated the Kale but rather sautéed it with the flavors from the recipe, tossed with steamed green beans and parmesan, wa- lah delicious, fresh with a spicy kick veggie side, that can easily be brought to your Thanksgiving table feast! Tuscan kale, also called black kale, dinosaur kale, Lacinato kale, or cavolo nero, has long, narrow, dark-green bumpy leaves; it’s available at farmers’ markets and some supermarkets. Heat a large dutch oven skillet over medium heat with Olive oil. Add kale lemon juice, honey, and red pepper flakes and toss to coat. Season to taste with salt and pepper. Once the kale is bright green and slightly tender remove from heat and put in a large serving bowl. Cook beans in a large pot of boiling salted water until crisp-tender, about 4 minutes. Drain beans. Add beans to kale and toss to coat. Season to taste with salt and pepper. Top with grated cheese. At long last, warm long summer days have equated to summer vegetables popping up at the farmer’s market! 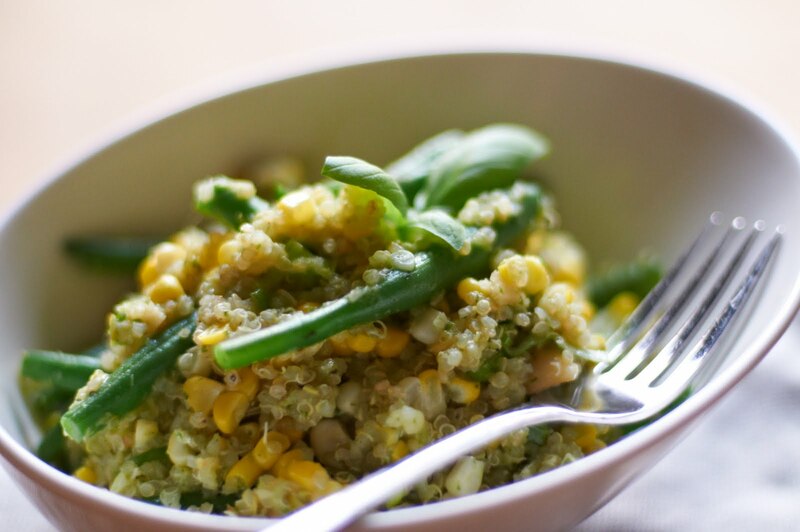 Knowing we wanted a fresh salad for a side to serve with dinner, we hurriedly picked out the best summer staples- corn on the cob, basil and zucchini. We just barely made it through the tents when the wind kicked up and sky turned black, another summer favorite- summer storms that fly in as quickly as they go… Not to worry, this salad will certainly brighten any stormy summer day- it’s our very own concoction so please comment and try it out, we’d love to hear what you think! 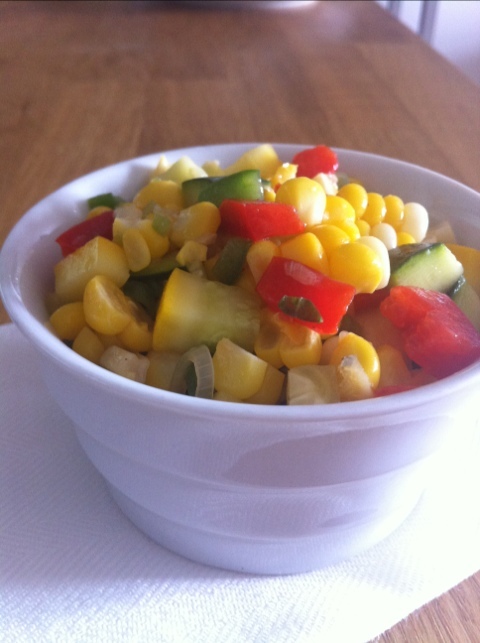 In a medium bowl, combine all ingredients except for the corn. Cook your corn by rapidly boiling for 8-10 minutes in a large pot, then remove the kernels when the corn is slightly cooled but still warm. Make sure the bottom of the cob is flat. If it has a round tip, slice it off. Hold the cob upright on the board. Run a large sharp knife down the side of the cob cutting off the kernels. Cut as close to the cob as possible. Rotate the cob in your hand and continue to cut all four sides of kernels off. Toss the corn kernels in to your bowl and adjust salt/ pepper seasoning to taste. To be quite honest, it’s been very hot and our electric bill is insane. So, we’ve been eating salads- much to Jason’s chagrin. 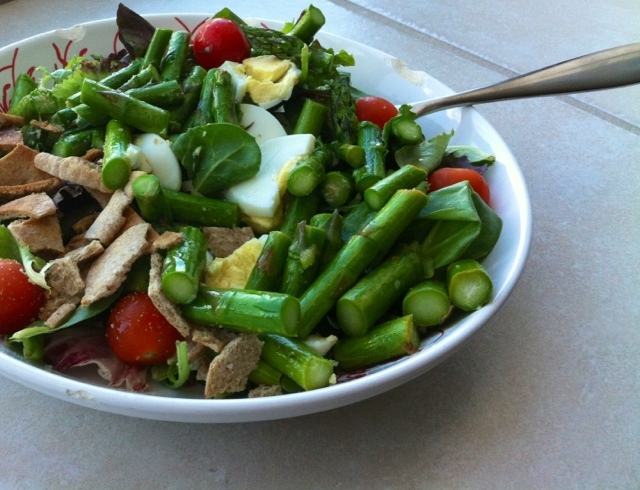 So to make it filling and hearty we tossed in what we had in the fridge with some springy boston lettuce chopped. 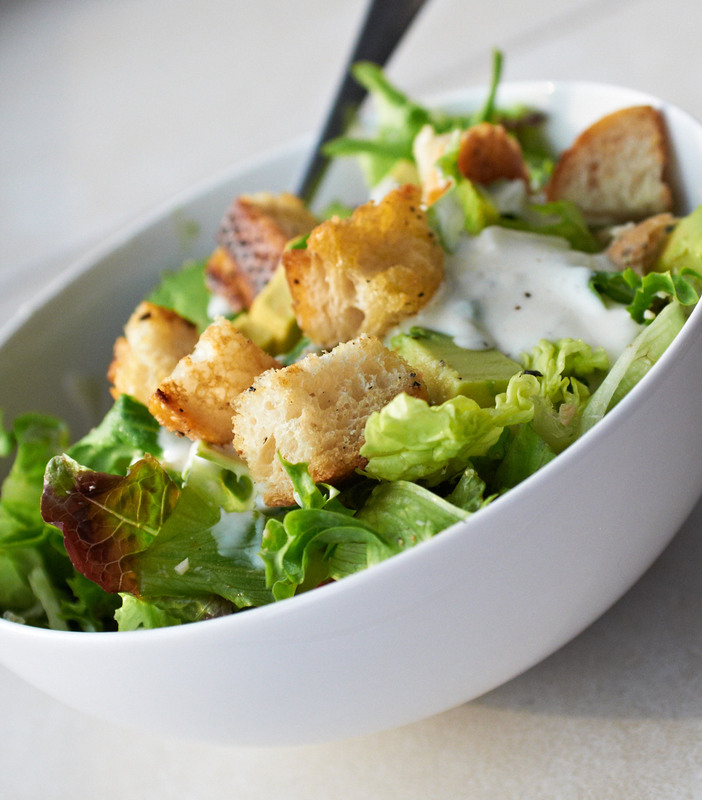 Our list of stuff included roasted chicken, avocado, green onion, cherry tomatoes, homemade croutons (recipe here), and a light version of homemade ranch dressing- recipe follows! What is your favorite thing about potato salad? What is your favorite summer produce? Cook potatoes in large pot of boiling salted water until just tender, about 10 minutes. Add beans; cook four minutes longer. Drain well and let cool, then transfer potatoes and beans to a large bowl. Meanwhile, discard the stems from the basil and wash and dry the leaves. Puree them in a food processor with garlic, drizzling in enough olive oil that it gets saucy. Add in toasted almonds and grated cheese, pulse till smooth. Season the pesto with salt and pepper. 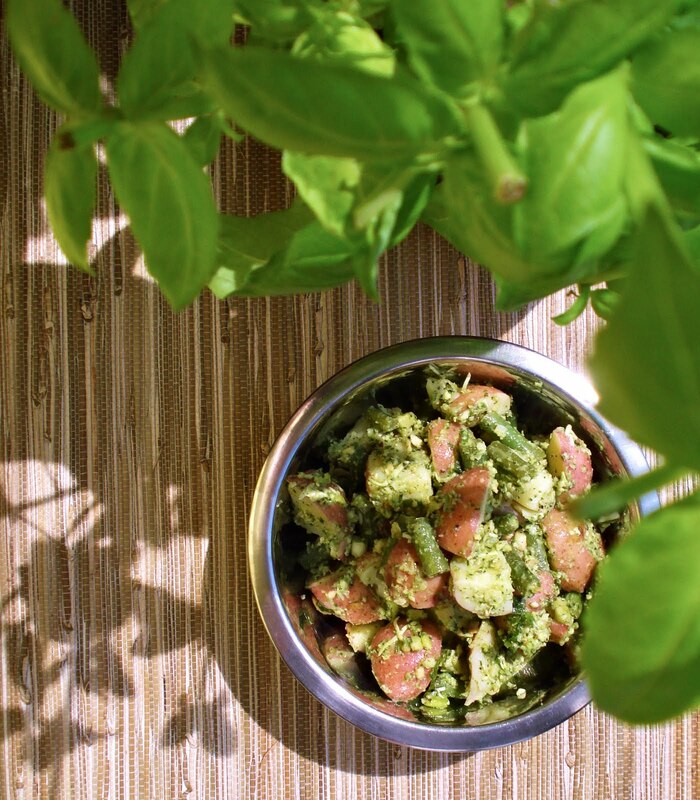 Toss the beans and potatoes with pesto. Stir in vinegar, green onions and season with salt, pepper and/or additional vinegar to taste. I made this the night before serving, stored in the refrigerator. It was delightful!